Pressure injuries are considered a preventable condition in Australia and the National Safety and Quality Health Service Standards (2012) requires health service organisations to implement evidence-based systems to prevent them. 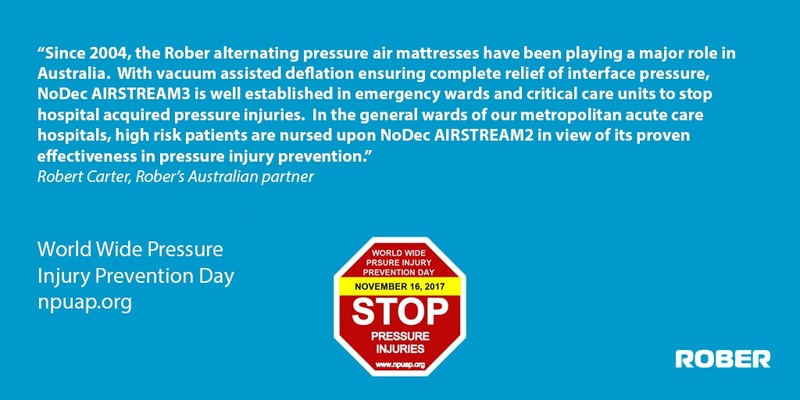 This week to celebrate Worldwide Pressure Injury Prevention Day, dynamic air mattress specialist Rober, has spoken to its Australian partners to find out more. “Since 2004, Rober’s alternating pressure air mattresses have been playing a major role in Australia,” said Robert Carter, Rober’s Australian dealer. Robert added that in the general wards of metropolitan acute care hospitals, high-risk patients are nursed upon NoDec AIRSTREAM2. This reason for this was its proven effectiveness in pressure injury prevention. Large regional hospitals and aged care facilities in Australia are now using Airflex Trio, as it is easy for staff to set up and operate, and its 3-cell cycle provides good pressure ulcer prevention. Worldwide Pressure Injury Prevention Day is taking place on November 16th, 2017. Organised by the National Pressure Ulcer Advisory Panel (NPUAP), its objective is to increase global understanding of pressure injury prevention through education.